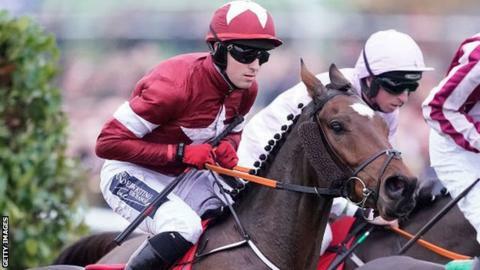 Grand National winner Tiger Roll set up his spring campaign with victory in the Boyne Hurdle at Navan by four lengths at 25-1 ahead of Off You Go. The nine-year-old gelding is looking to be only the second horse, after Red Rum in 1973 and 1974, to win back-to-back titles at this year's Aintree. Coquin Mans had led the field, but then Tiger Roll, ridden by Keith Donoghue, jumped the penultimate hurdle in front. Trainer Gordon Elliott said it was "one of his best performances over hurdles". Elliott, whose horse is a three-time Cheltenham Festival winner, added: "I'm delighted with the way he ran. He's a great horse and never lets us down. "The plan is the cross-country race at Cheltenham and obviously the English [Grand] National, all being well. "It was a nice surprise. I thought the two horses, Bless The Wings and him, would finish second-last and last so it was a nice surprise. "He's paid for himself for the year again." Elliott described Tiger Roll as only "75% fit" on Sunday and bookmakers reacted to the win by cutting the horse' odds for the National to 12-1 favourite, from 20-1. The Gigginstown House Stud-owned Tiger Roll next runs in the Glenfarclas Cross Country Chase, which he won at Cheltenham in 2018.